First of all, we must note we’re deeply confused about what to call this category of baby product – playard (wait, why isn’t it a play yard? ), pack ‘n play? Travel crib? We’re just not sure who names these things or what the logic is here. 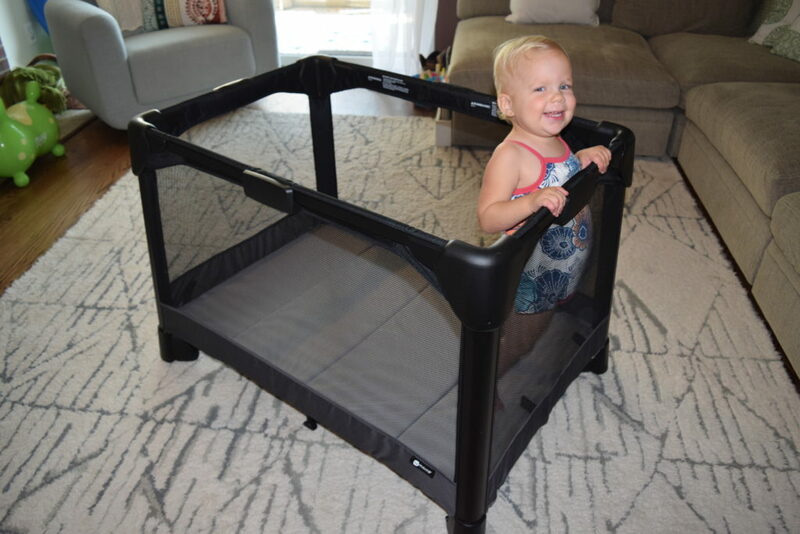 Obviously, you can use them for a “yard” for your baby to play in that’s safely enclosed to keep your baby away from dangerous stuff … but mostly we’ve used them a travel version of a crib – a safe place for your baby to sleep at night, and for naps. Ok, sorry, had to get that out of the way. Secondly, please note Fathercraft is reader-supported, meaning, at no cost to you, we may earn a commission if you buy after clicking an affiliate link. More on our policies here. Recently, the Fathercraft crew took a trip to Moab, Utah, to do some hiking. With us, we brought a 9-month-old and an 18-month-old. This seemed like a great place to test two pack ‘n plays head to head. Truthfully, it had nothing to do with the desert but, you know, sounds cooler that way. Instead, it had to do with 2 young kids in an Airbnb with two sets of parents to test travel cribs and compare notes. 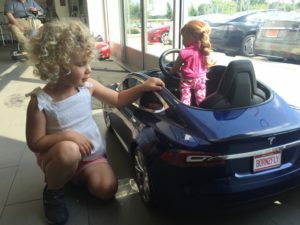 We brought two playards (ok, we officially hate that word – last instance of it) with us – the Nuna Sena Aire (Nordstrom) and the 4moms Breeze Plus (Amazon). Both of these had received top ratings in our online research, and neither of them was manufactured by Graco, which was important because a Graco pack ‘n play had nearly reduced me to tears on more than one previous occasion when I was trying to set it up for a really tired baby and just couldn’t make it happen. 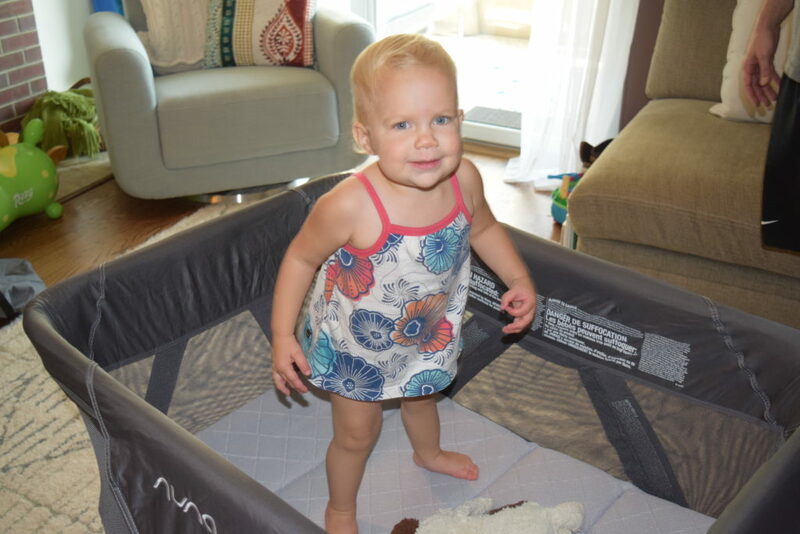 Our goal: understand what was the best pack ‘n play out there. The Nuna Sena with a pretty big 20-month-old for scale. We’ll start with some basic stats, dig into comparisons of each across a variety of features and functions, and end with some final thoughts and a winner. As with all pack ‘n plays we’ve seen, both of these packed up by first removing the mattress, folding the crib part up, sticking any accessories in between the legs, and then putting the mattress (both mattresses fold into 4 sections) around the bundled legs like a rectangular burrito. Then you use some velcro straps to secure this bundle before putting it into the bag. This part of the packing process was about the same for both. Both of these travel cribs are remarkably easy to set up, especially compared to our experiences with Graco. From packed, you unwrap the bundle, push down on the point that will be at the center of the crib’s mattress, which forces the thing to expand until, with a satisfying finality, it’s fully standing. Then, you put a sheet on the crib mattress and place it into the crib. Finally, you secure the mattress to the underside of the crib with some velcro straps. This does involve some manipulation with each one, but these things are light enough you can put them on their side to do this if you want. 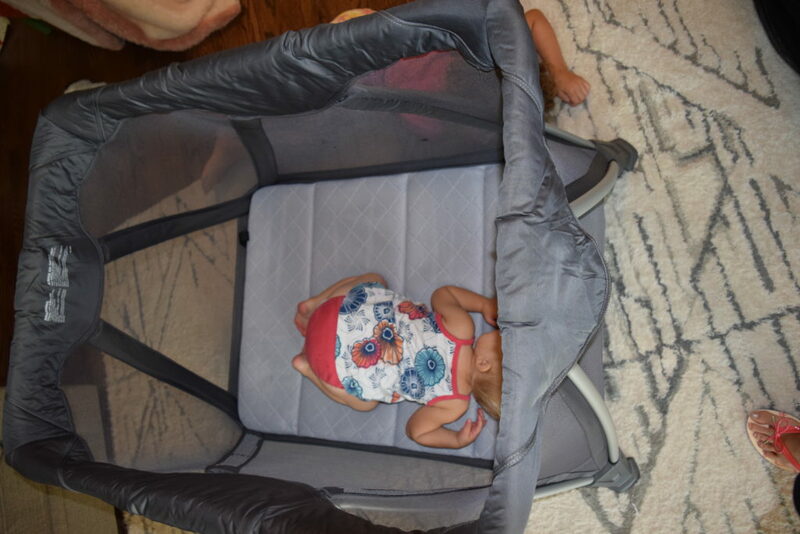 If you’re thinking, “well that sounds like what I’d expect” you haven’t owned an older Pack ‘n Play. The older Graco we’ve used involved trying to lock each individual side while trying to keep the middle from collapsing and trying to remember which sides you needed to lock first – the long ones or the short ones. The only real difference in setting up the regular part of these two is the sheet. The Nuna Sena’s sheet is included, and includes velcro near its fitted edges, which needs to be aligned with the velcro on the underside of the mattress for added security. It’s also worth noting that while the Sena comes with a sheet, the 4Moms sheet is sold separately for $39.95, which seems like a lot to us, though it is waterproof to protect the mattress, Sena’s sheet is not (though the company does note the fabric on the Sena is water resistant). 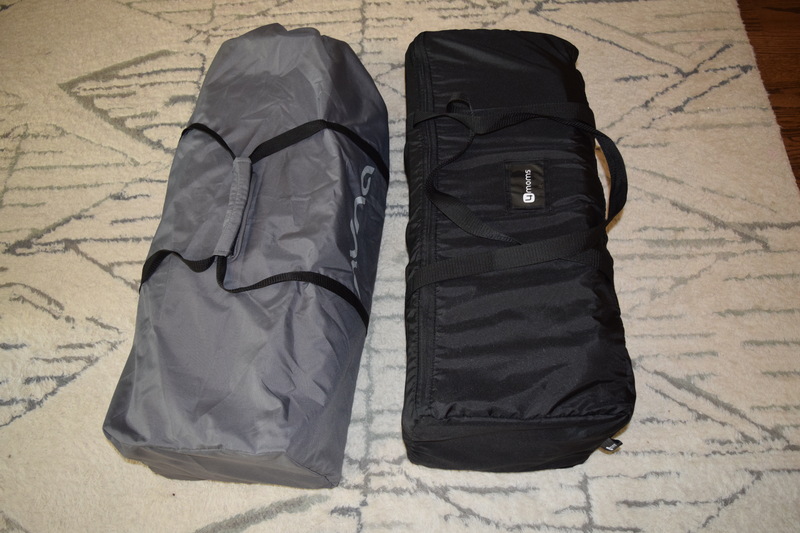 The place you do start to notice a difference with these two travel cribs is with the addition of the bassinet/changer. If you’ve never used a travel crib before, this would be a good time to let you know that the regular mattress in a travel crib is close to the ground, and sides are tall. And this can make the act of bending way down to reach a baby who’s not yet sitting or standing a real pain. At first, we thought the addition of a changing pad to a pack ‘n play was serious feature creep and a bit of a gimmick. Then, we started thinking about how we normally changed babies while traveling – on the floor, or on a bed while holding on for dear life to prevent a little one from rolling off (even if they were too small to roll). The “changing table” in the Breeze Plus, therefore, turns out to be a welcome addition – no more kneeling, bending, or freaking out when changing a small baby. Plus, it’s got a waterproof cover for inevitable imperfection when changing. The bassinet in the 4Moms Plus is quite close to the top. This is great for an infant or very young baby who can’t push up or sit up at all, but we’d be nervous to use it beyond a couple of months due to proximity to the top of the sides. 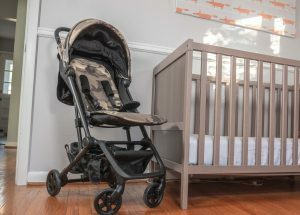 In addition to #2, it’s worth noting the bassinet also just isn’t that big – since your baby goes width-wise across the pack ‘n play in this configuration, the length of the bassinet is maybe 28 inches at most. Snapping the changer/bassinet combo into the Breeze plus is, literally, a breeze. You just snap about 8 hooks over the top of the sides and you’re good to go. 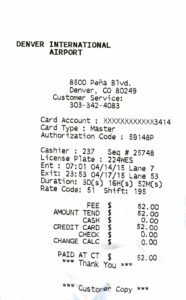 It couldn’t have been easier (or more different than the Sena – see below). 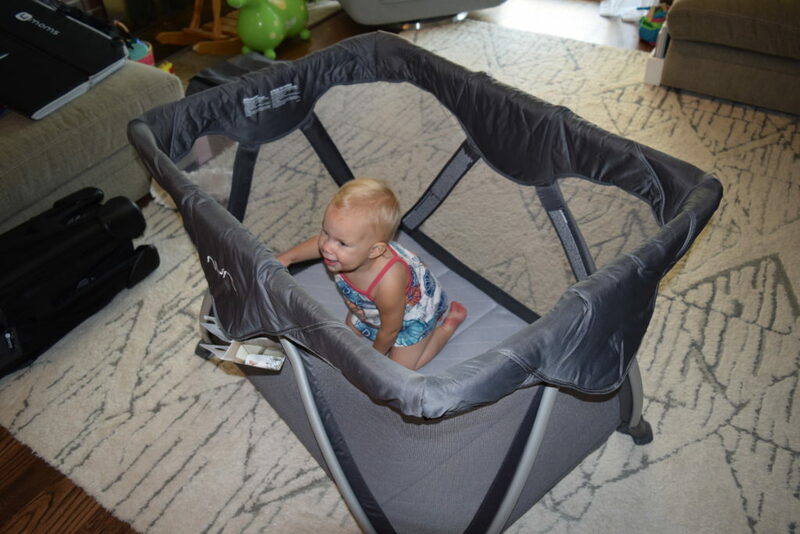 The Sena Aire, on the other hand, features a contraption that elevates the crib’s mattress (you use the same mattress) to about half its normal depth within the crib. As we discuss in the conclusion, this makes it practical, and more safe, to use for slightly older babies (though you still wouldn’t want to be using with a baby who can sit or pull up. Clearly, this toddler is too big for the Sena’s bassinet. The major downside to note here is installation. Unlike the Breeze, which snaps on in a matter of seconds, installation of the Sena’s bassinet involves securing 8 combination buckle and snaps, all done underneath the rim around the top of the sides. I really struggled to do this, but it did certainly make me feel like it was securely attached when it was finally on. 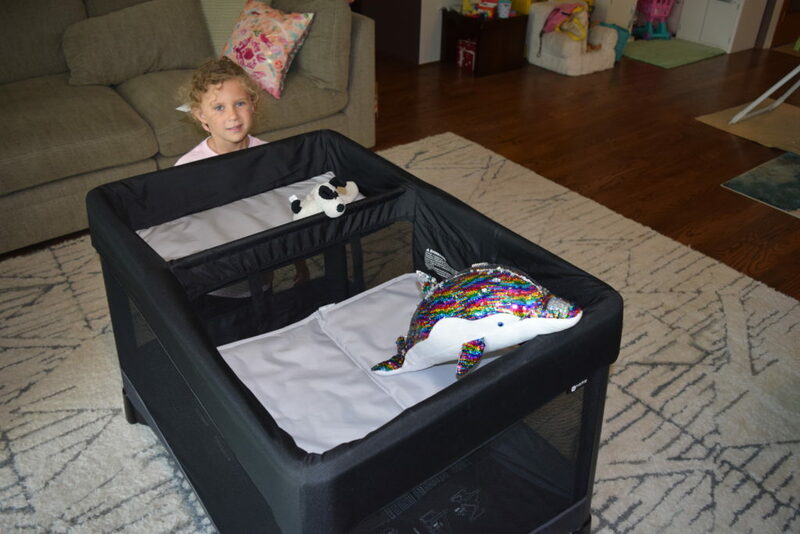 Taking down a travel crib is almost always easier than setting up, and these two are no exception to that rule. To take them down is the exact opposite of setting up, and similarly easy to do. Once the mattress is removed, you pull on a strap in the middle of the crib that easily folds it back up, and can be done one-handed. The 4Moms mattress notes it’s cleanable with a damp cloth, while the Nuna Sena’s mattress has a cover that zips off and can go in the washing machine. It may be because of this difference that 4Moms sells a waterproof sheet while the Sena’s sheet is not. A difference in the sheets is that the Sena’s sheet velcros to the bottom of the mattress and is labeled as being made with organic cotton. Again, these two are quite similar. They both feature fine mesh sides for breathability and to prevent baby fingers, etc from getting caught. Both mattresses fit snugly against the frame to prevent a baby from potentially becoming trapped at the seams. Both of them also feature sleek, modern designs that won’t create an eyesore if left in parents’ bedrooms or living rooms for long periods of time, though we’d argue the 4Moms is slightly sleeker. Both even feature their own unique, potentially silly accessories – you can purchase an insect net for the Sena Aire (Nordstrom), and a diaper caddy that attaches to the Breeze Plus. Each of these travel cribs also sells variations. Nuna sells a Sena Aire Mini (Nordstrom), which is about 10% smaller and weights 6.5lbs less than the Sena Aire for an MSRP of $199. 4Moms sells the Breeze Go (Amazon), which isn’t actually any smaller than the Breeze Plus, but skips the changing pad and bassinet, isn’t quite as sleek looking, and retails for $100 less. Alright already, which one should I buy? Now that we’ve gone into exhaustive detail, the question might remain – which one should I buy? The answer, we think, is “it depends”. Overall, these two are pretty darn similar on many fronts (and as we’ve noticed, a significant leg up on their competition.) We tend to like the 4Moms just slightly better from an ease of use perspective, and due to the fact it’s slightly lighter and has a better travel bag. But, there’s a question of what you’re going to use it for. If you’re looking to use one of these less as a travel crib and more as an in-home (or in grandparents’ home) option from birth, the Nuna Sena’s bassinet is more practical to use as your baby gets slightly bigger and you’d no longer be comfortable using the 4Moms’ bassinet function. And if the thing is going to be a semi-permanent installation in your house, the pain of setting up the bassinet is one-time. For Nuna products, we like Norstrom.com for the fast, free shipping, great customer service and ease of returns. If you’re intro the Nordy Club (Nordstrom rewards program) like both of our wives, these projects can earn points toward that. 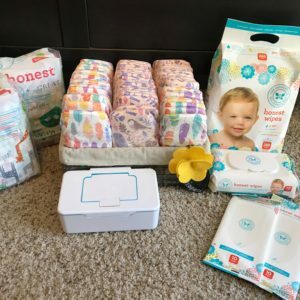 this review was originally published in August, 2018, but was updated in January 2019 with additional information on Nuna and 4Moms products. Tools for the modern father. 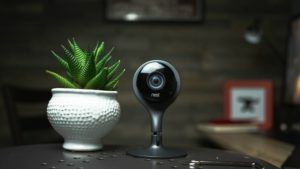 Speaking of bells and whistles, many of the baby monitors on the market today have an astounding number of additional features. And, based on our testing, there’s a fairly even split between features that serve a real need and features that just aren’t particularly useful. As we’ve said before about other baby-related products – if you use it in the middle of the night, it damn well better be easy to use. As monitors add more bells and whistles, it becomes harder to have a logical, intuitive user experience. Most monitors with a dedicated parent unit constantly have an open audio channel – meaning as soon as your child makes a sound, you’ll hear it in real time. 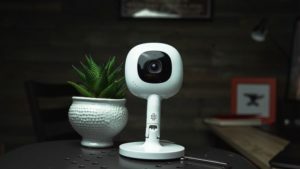 However, with wifi baby monitors we reviewed, a constant audio feed isn’t a given as the monitor app often gets relegated to the background when you do other things on your phone or tablet. So, having a rock-solid alert system or process for creating a constant audio feed is an important issue any wifi monitor needs to solve. We’d argue that sound quality and sensitivity are more important than picture quality. After all, you aren’t going to be constantly staring at your child through the monitor (hopefully sometimes you’ll be sleeping, too) so being able to hear your child clearly is hugely important. 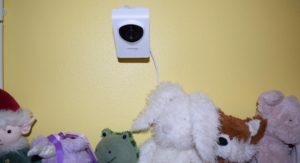 Seeing your child is a critical part of the function of a baby monitor, and picture quality in monitors can vary widely. We include night vision as part of the picture quality discussion since your baby will (and should) sleep in a dark room, at least a large portion of the time. If you don’t have a strong enough signal that you can clearly and consistently connect to the child unit located where your child is sleeping, your monitor is useless. We’ve used a number of monitors with our own kids where the range of the monitor was a major issue, even in smaller houses.